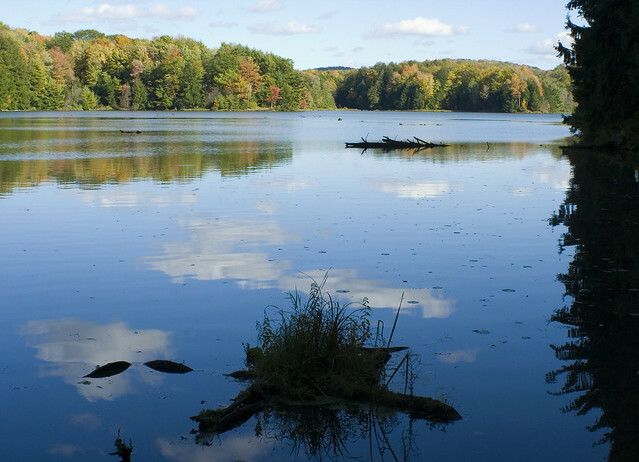 Located in scenic Tioga County, the 407-acre Hills Creek State Park abounds in wildlife. Osprey, loon, and waterfowl visit the lake that boasts a variety of warmwater fish species. Camping, cabins, swimming, and picnicking make this an ideal spot for a family vacation. Hills Creek State Park, in northcentral Tioga County, is just north of US 6 and midway between Wellsboro and Mansfield. The park is also reached from PA 287 between the towns of Tioga and Wellsboro. In the day use area, on a hill overlooking the lake and beach, the concession offers a wide variety of food like hamburgers, sandwiches, candy, ice cream, and drinks. It also has milk, camping supplies, firewood, and fishing bait. The concession is open from Memorial Day to Labor Day, 11:00 A.M. - 7:00 P.M. daily, weather permitting. For information concerning the concession operations, call 570-724-2992 or the park office at 570-724-4246. The park operates a seasonal visitor center in the camping area. A variety of interpretive programs are offered year round.